Your local cell phone experts in Portland, Vancouver and surrounding areas. CompRite is your local used cell phone super store for all carriers in the Portland Metro Area and Vancouver, Washington. CompRite's main focus is getting the wireless cell phone you want, without a contract! From the moment you walk in to any of our five stores, or when the technician repairs your current phone, you will know you have made the right choice for all of your Portland cell phone needs. Need a used cell phone or smart-phone for AT&T, Verizon, Sprint, Cricket or T-Mobile? We got it! Visit your local Portland cell phone store location near you! CompRite also unlocks, jailbreaks and roots phones! CompRite's repair technicians can unlock and jailbreak your Apple Iphone to work on other networks, flash your cell phones to Cricket, or root your Android phone for super user permissions! CompRite’s approach to cell phones is very simple: identify the need, respond quickly, and deliver the RIGHT solution at a fair price. Need Accessories for Your Cell Phone? We have cell phone home chargers, car chargers, cell phone batteries, extended life batteries, covers, cases and screen protectors. Let us know what you need! CompRite is your one stop shop for all of your cell phone needs in the Portland Metro Area and Vancouver, WA. Give us a call today at 503.928.3150 or drop in to any one of our five locations throughout the Portland Metro and Vancouver, WA areas. CompRite now offers affordable prepaid cell phone services with amazing coverage better than Cricket! NO CONTRACTS, NO CREDIT CHECKS. Stop by any of our 4 locations to get your prepaid cell phone and monthly service today! 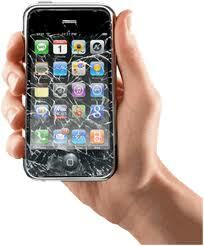 CompRite repairs broken iPhone screens, digitizers, and more! Is your Blackberry trackball broken? We can fix it! Is your phone freezing up? Bring it in and we'll take care of it!